As more and more homes are built in suburban areas, on wooded lots, with decks, mulch beds, thick bushes, surrounding trees and decorative landscaping, the amount of insect and rodent activity has increased. At General Pest Control, we have developed our seasonal pest control service program to minimize the annoyance of these invading pests — by stopping pests before they get in. We inspect and treat the outside of your house three times during the year — spring, summer and fall. In this way, we stop pests BEFORE they enter your home. These three treatments are designed to coincide with the time of the year when pests are most active. We treat the critical areas where pests nest, harbor and/or enter. We developed this package with your busy schedule in mind. You won’t have to interrupt your normal routine, nor will you have to be home. No appointments are necessary for the three regular services. We come — We treat — We leave you a notice. Some pest problems cannot be anticipated or prevented. Our program does not cover urban wildlife (squirrels, raccoons, chipmunks, birds, etc.) 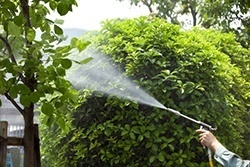 flies, fleas, ticks, clothes moths, carpet beetles, termites, gnats, pharaoh ants, clover mites, mosquitoes, pests originating from nearby vegetation (lady beetles, etc.) and treating entire wood shingle roofs. These special problems would be treated as needed and charged on a discounted basis from our regular service fee. We give you the strongest service warranty in the industry. If a pest we have treated for comes back to bother you, we’ll do whatever is necessary to eliminate the problem inside or outside — year ’round at no additional charge. This extended warranty is given to those customers who maintain the three regular service calls each year. We are so confident that our seasonal pest control program will prove successful that we offer this money back guarantee. If you are not satisfied with the results of our service and we are unable to correct the problem within a reasonable length of time, we will refund the fee you paid for the last regular service. Your satisfaction is our primary concern. Compare our Seasonal Pest Control Service Program with any other residential service program, and you will find our services to be superior and your savings to be substantial. A seasonal plan is more cost-effective than calling for individual single treatments as needed. We will bill you each time we treat your home — once each in the spring, summer and fall. Alternatively, in the spring you will have the opportunity to pay in advance for the entire year, and you may take a 3% prepayment discount. We accept VISA, MASTERCARD, AMEX and DISCOVER. The Seasonal Pest Control Program begins with an initial residential service for a specific pest problem and includes our 90-day warranty. You can join our service anytime within six months of the original treatment date without having to repeat the initial service. If you are already on a monthly or quarterly pest control program, you may switch to ours without incurring an initial service treatment.